I had read an article long time ago, about tooth tattoos. And though I admit that I like reading and learning about the latest fashion trends, this was one trend that I did not like..(wait ..that's too mild a word)...I absolutely hated it. I mean how far can one go to look different and stand out in the crowd. 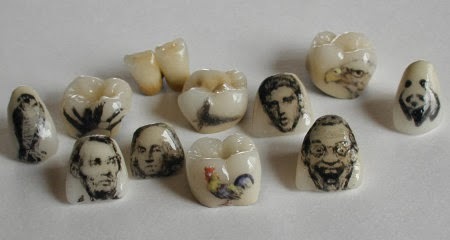 I admit I do not know much about fashion, but Tooth Tattoos...?? Seriously?? When I saw the pictures of tooth tattoos, with blurred vision they looked like tooth decay, or like some food particles stuck on the tooth. But then again it is my personal opinion and there are many others who may beg to differ on this point. And then why not?? Like I always say... KAL HO NA HO..! Do it, if You like it..! Do it if it makes You happy..! But don't do it for anyone/anything else! 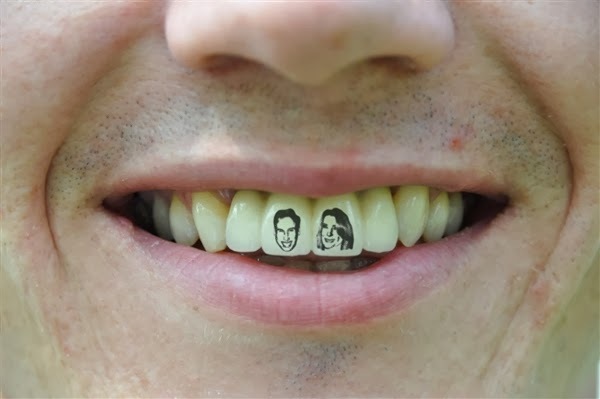 Tooth Tattoo of Prince Williams and Kate Middleton. That was cute. But never on my tooth. P.S. This is a pre-scheduled post. I do not own the images used in this post. Ewwww, I am totally with you, I don't understand this trend.. It makes no sense to me. Hahaha .. this is a funny trend. I can't get onboard with tooth tattoos either!